We began the class with Parvritta Swastikasana. Uttanasana with Head on Block. Adho Mukha Svanasana. Stand facing the wall with the rope slipped around your waist. Step over both sides of the rope with one leg, and then turn around to face away from the wall. Slide the knot down onto your sacrum. Bend your knees and fold forward into Adho Mukha Svanasana. Keep your heels at the wall and as close to the floor as you can. Reach your hands forward. The rope extends the lumbar spine toward the wall, while the hands draw the spine forward. These opposing movements extend the lumbar, decrease compression of the disc on the nerves and reduce low back pain. Turn toes in. Working with a block between her hyper extended elbows helped reduce the pain in her arms that occured whenever she did this pose. Uttitha Hasta Padangustasana 1, with Back to The Wall and Pully Ropes. Uttitha Hasta Padangustasana 2, with Back to The Wall and Pully Ropes. Standing Twist to Wall with Pully Ropes. My host, Rany Fetrix made t-shirts from my drawing. 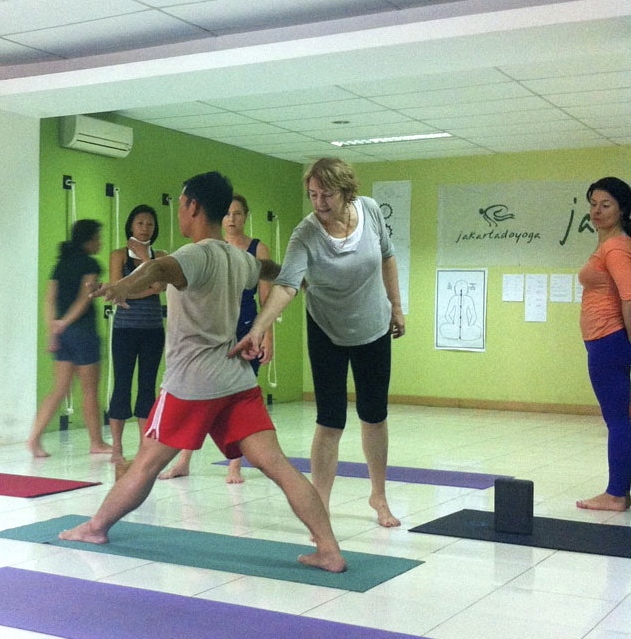 I taught a four day workshop in late February at Jakartadoyoga, Indonesia. I’ve never seen so many students in a class get into Malasana II (Garland Pose) so quickly and so well. These students didn’t need any instructions – they just did it! But for the rest of us: keeping your feet together, bend your knees and lower your hips, coming into a squat. If your heels lift, support them on a folded blanket. Find your balance there for a few moments. Separate your thighs so they are slightly wider than your torso. Move your self forward until your armpits extend beyond the knees — your torso should fit in snugly. Join your hands in a salutation as you press your elbows against your inner knees and your shins into your armpits. Clasp your ankles. Fold forward taking your head to floor, close to your toes. To help keep the internal rotation of your thighs, thereby bringing them closer to the side ribs, press down through the inner heels. 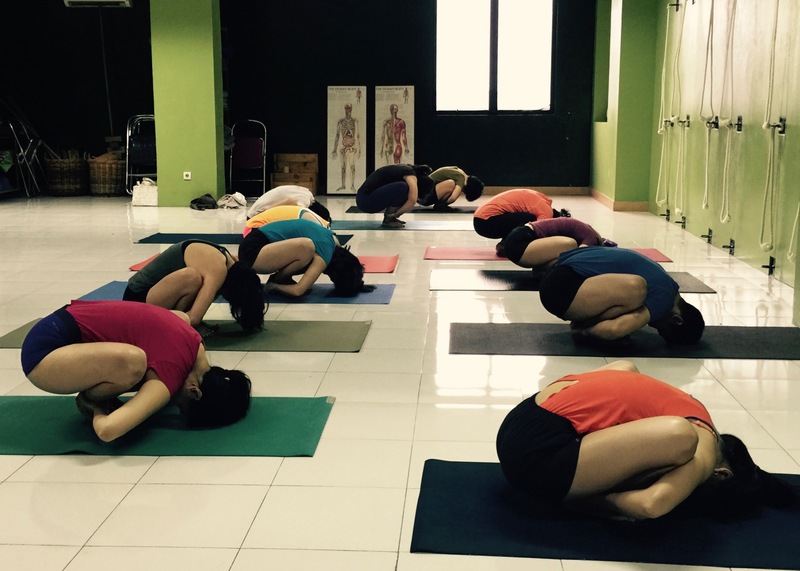 This pose brings relief for women who suffer from low back pain during menstruation. 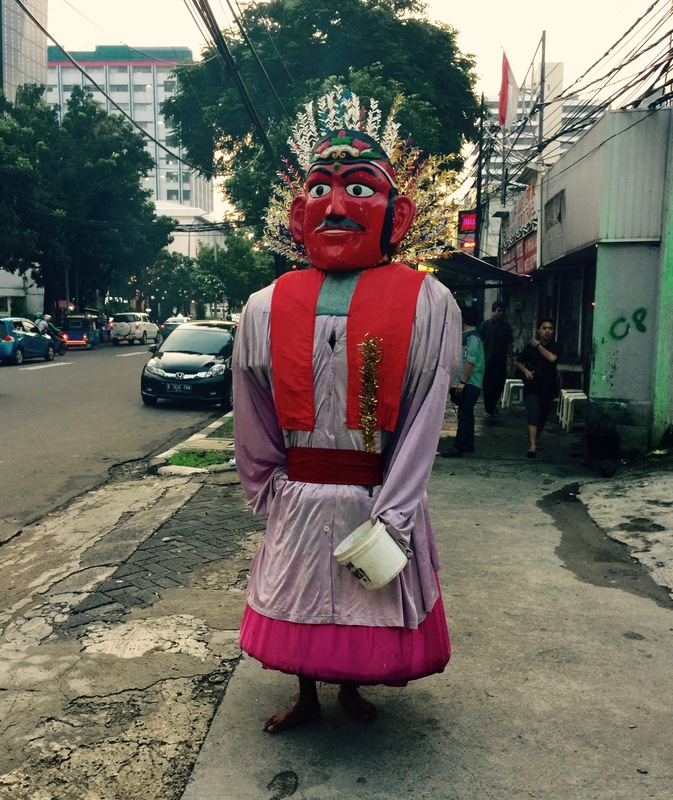 Jakarta’s mascot is their version (in this context at least) of Micky Mouse and other cartoon characters on Times Square. Much was covered in my four day workshop in Jakarta. In the first four classes we explored the elements and koshas, which included standing poses (anamayer kosa: earth), jumpings (pranamaya kosa: water), twists, and backbends on the ropes ( manomaya kosa: fire) and inversions and pranayama (vignaomaya kosa: air and anandamaya kosa: ether). “From your physical body, you can journey inward to discover your ‘subtle bodies’; your energy body pranamaya kosa: [element of water] where breath and emotions reside; your mental body manomaya kosa: [element of fire] where thoughts and obsessions can be mastered; your intellectual body vignanomaya kosa: [element of air] where intelligence and wisdom can be found and your divine body anandamaya kosa: [element of ether] where the universal soul can be glimpsed.” — B. K. S. Iyengar, Light on Life. The physical body (annamayer kosa) corresponds to the element of earth. The standing poses, when practiced from and returning to tadasana increase the element of earth in the legs, which become strong and steady. The nadis. The life force condensed in the subtle body travels along pathways called nadis (Nadi: a duct or conduit). The tree like nature of the subtle body contains around 72,000 of these nadis. Yogin With Six Cakras. Painting. Kangra school. Late 18th century A.D. From Tantra Art: its Philosophy & Physics by Ajit Mookerjee. © 1966 by Ravi Kumar. The chakras are pools of life energy, vibrating at different rates and located on the midline of the body. The three chakras located at the lower regions of our body represent our instinctual nature, the four highest ones reflect the mental and spiritual aspects of our being. 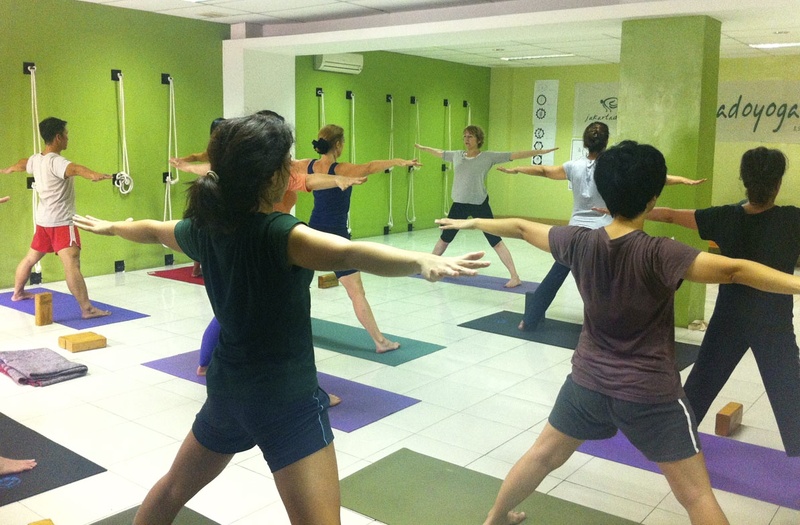 Thanks to all the lovely people at Jakartadoyoga! Visit my website, bobbyclennell.com for upcoming workshops.